The first Release Candidate of the new DNS and DHCP server from ISC, BIND 10 (http://bind10.isc.org) was released on February 15, 2013. Men & Mice is monitoring and supporting the BIND 10 development, and as part of that, our engineers sometimes create little helpful tools to share with the community. TSIG is short for Transaction Signatures, defined in RFC 2845 "Secret Key Transaction Authentication for DNS (TSIG)". TSIG is primarily used to authenticate DNS zone transfer between DNS servers, and to secure dynamic DNS updates. BIND 10 supports TSIG for both zone transfer and dynamic updates, but it does not contain a tool to create the TSIG keys. While it is possible to use the tools from BIND 9 (https://www.isc.org/wordpress/software/bind/) or ldns (ldns-keygen, http://www.nlnetlabs.nl/projects/ldns/), installing these tools along with BIND 10 might be too much overhead. Men & Mice engineers have written a small tool in Python called b10-gentsigkey.py (https://github.com/menandmice/b10-gentsigkey). b10-gentsigkey supports all the TSIG algorithms that are also supported by BIND 10 ('hmac-md5', 'hmac-sha1', 'hmac-sha224', 'hmac-sha256', 'hmac-sha384', 'hmac-sha512'). We hope to bring a similar command into the BIND 10 CLI (bindctl), so that no external tool is required to create TSIG keys by an external tool. Until then, enjoy this little tool. If you are interested in learning more about BIND 10, Men & Mice is working close with ISC to deliver the first industry training on this new version of the BIND name server software in Amsterdam, Netherlands from February 20th - 21st, 2013. You can learn more about it from the Men & Mice BIND 10 workshop page. BIND 10 is the next generation of BIND, the most widely-used DNS server on the Internet. It is modular server that includes an authoritative DNS server, a recursive DNS server, a DNSSEC signer and a DHCP server for IPv4 and IPv6. BIND 10 first production release to be expected in 2013. 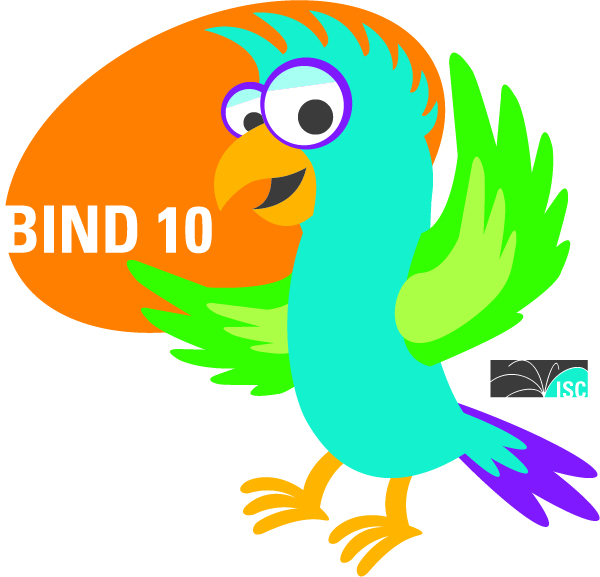 Additional information on BIND 10 can be found on the BIND 10 project website http://bind10.isc.org. 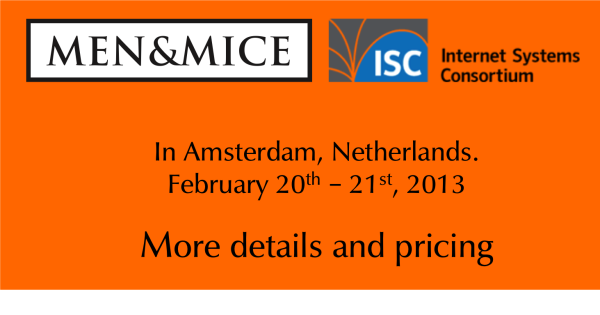 Men & Mice is working close with ISC to deliver the first industry training on this new version of the BIND name server software in Amsterdam, Netherlands from February 20th - 21st, 2013. This is a classroom-style course with lecture and hands-on labs. configure BIND 10 as an authoritative DNS Server, a DHCP server and automate DNS and DHCP data provisioning using the BIND 10 management toolset. The class is geared towards sysadmins and network administrators with basic knowledge on DNS. Knowledge on BIND 9 is not required.